SWADDYL Baby swaddle, wrap receiving blanket for newborn baby. Keeping the little one warm and cosy. Fits in the car seat with 3-Point Strap System or for buggy/pram or as a regular wrap or baby blanket in the crib. Double sided, 100% cotton on one side, super soft, cosy minky plush on the other side. Can be used on both sides. Stylish design, durable, luxurious, chemical-free formulation. Made in Europe. Wrap the baby with the SWADDYL blanket and with love and go out warm and beautiful. Put the blanket in the car seat, take the straps and buckle through the slots, put the baby inside, buckle up, wrap the baby with the blanket. With hood for the head and leg pouch to keep the baby warm. If it gets too warm, open the blanket, baby will not be disturbed. Very beautiful gift for newborns, baby showers and for holiday present. Suitable for Baby from age 0 - 5 months. 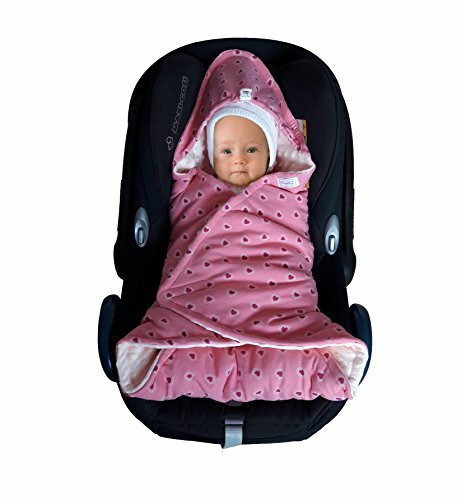 - MULTI-USE: Swaddle, wrap, receiving blanket for car seat with 3-Point Strap System Chicco Graco Britax Maxi-cosi etc. or Stroller, buggy, baby bouncers, cuddle, travel, playing mat for toddlers up to 5 months for cold mornings, chilly summer, fall or spring days. 75x75 cm Perfect for travelling. - QUALITY: Premium quality, double sided with filling, cotton on one side, super soft, cosy minky plush on the other side. Stylish design, with hood and leg pouch, made in Europe. - EASY to USE: With slots for putting the straps of the car seat or stroller through, for 3-Point Strap Systems. Easy transition in and out keeping the baby warm and wrapped. Baby is not disturbed while sleeping. If it gets too hot in the car, just open the blanket. If you have any questions about this product by Swaddyl, contact us by completing and submitting the form below. If you are looking for a specif part number, please include it with your message.